In a February post I wrote about Thermal Imaging and that it can be considered quality assurance work for your (new) house. Yesterday evening we finally received a binder with several infrared shots of our house (paper only). 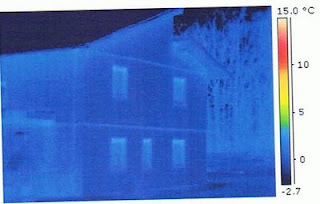 The scanned image below shows the West side of our house with the forest in the backdrop. The picture was taken around 10pm when it was around 1 degree Celsius outside. Clearly visible is the roof, the windows, and on the left our porch. You might wonder about the one whitish vertical and the two horizontal lines. We have a prefabricated house and those lines indicate where the large panels have been joined. Energy-wise those joints are the weaker spots. However, in our case the entire house fares very well. QA passed!